This week for my S post, I had several that I wanted to do. They were all promo type pieces and fairly short. Which to pick? What should I do? I know, combine them all! So for my post on S, my S is for S. Have a look at all these S’s in my life. I hope you enjoy them as much as I do. My first S is the Sunday Stew. Formatted and presented by Kallan Kennedy on her blog – The Secret Life of the American Witch, the Sunday Stew is published weekly on each Sunday of the month with special Sabbath Editions following the wheel of the year. The Sunday Stew is a wholesome serving of life experiences from an eclectic group of Chefs. Like getting a three card reading from a dear friend, the Sunday Stew offers a look at the past through the Pagan Lore; a look at today with the Pagan News and a look at the future with the Astrology section. Look for the Mabon Edition coming out September 22nd and if you’re interested in contributing to the Stew email Kallan Kennedy for more information. My second S is the Samhain’s Sirens Blog Extravaganza. 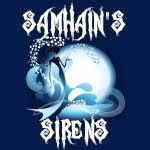 This is the second year I have participated in the Samhain’s Sirens Blog. It consists of a full month of wonderment beginning October 1st and ending on Samhain, the 31st. This year the event is being hosted by the lovely Serena Siren. She will be announcing updates on her Facebook Page and welcomes new friends. Serena has created a Blog page on Facebook that will provide updates on the new posts as well as any *extra* special editions to the blogging. The extravaganza will consist of bloggers from all over the internet with each day ending with a special giveaway. The blogs will be published on the Samhain’s Sirens blog page found on Blogger. I will be hosting the Saturday Craft-Tacular again this year, offering an assortment of crafts with easy step by step instructions. Each one ending with a chance to win the featured craft. Be sure to head over and *like* the Samhain’s Sirens Facebook Page & follow the blog on blogger so you don’t miss any of the fun. My third S is for Sosanna’s Closet. My own shop that I created out of my home just a little over two years ago. With the assistance of my soul mate, I take my wonderful creations around to different events in Eastern/Central NC and Southern VA.
My goal for the shop was to offer quality products at a reasonable price. For the last year I've been creating clay statues as well as protection masks and pendants out of natural wet clay and polymer clay. We offer altar supplies that don’t come from a big chain. Each one individually made, each spell written by me and not copied from a book. From the Juniper berries to the grave yard dirt, each ingredient comes from one specified source and when possible my own property. In addition to the retail part of the shop, I also conduct a dark moon ritual monthly where offerings to the Goddess Hecate are presented at the crossroads. I accept energy requests, blessings and ceremonial magic for protection, prosperity and cleansing at no charge. On both this blog and on the web page I have information on energy requests. My Facebook page lists new products before they are added to the webpage. So for a sneak peek at my new items head over and *like* my page. So that’s it. These are a few of the S’s currently in my life. I hope you've enjoyed this look at some of things I really enjoy working on. Aw, thanks for the Shameless Plug! !